If you know Arcam, you’ll no doubt be aware that they have a reputation for building audiophile grade products to suit almost any budget. For four decades, the English company have been filling the market with affordable and downright excellent hi-fi products, and their latest range of innovative Class G amplifiers proves they aren’t going stale yet. If you read my recent review of Arcam’s excellent FMJ A39 amplifier (see that here) and your appetite was whet but the price is a little off your budget, perhaps the smaller, cheaper A29 will fit the bill. It’s a good deal smaller than the A39 at 433 x 275 x 85mm (w x d x h) but no less handsome, and just as solidly built – it feels sturdy enough when applying the good old knuckle test. Putting out 80 watts into 8 ohms or 175 watts into 4 ohms, the A29 has the same G Class power supply as the rest of the FMJ range, where it works in Class A until more power is needed (up to about 20w) and Class G kicks in, gradually supplying more as required rather than wasting it in the form of heat. I’m still amazed at how little warmth is released even under heavy loads. The front panel is smartly laid out with a nice rotary volume control and a row of input selector buttons beneath a dimmable display screen. You’ll find 3.5mm headphone and auxiliary inputs conveniently located in the front, and around the back six line-level inputs as well as a very good sounding moving magnet phonostage. The phonostage can easily be switched off to become a normal line-level, which is ideal if you already have a separate phono pre-amp or plan to get one. There are also RCA pre-amp and recording outputs and binding posts for hooking up one pair of speakers. 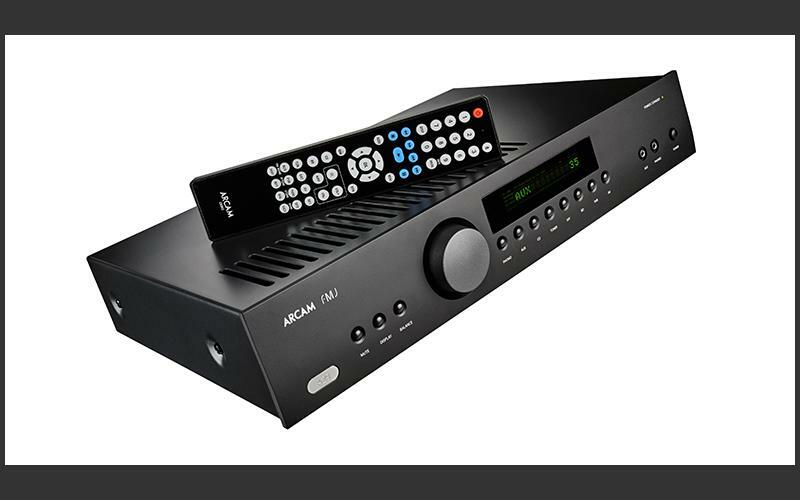 A very usable remote control is supplied and performs all necessary duties as well as serving to control Arcam’s current range of CD players. It would be difficult to dislike the appearance of this amplifier; with its straight lines, grey-black finish and smart modern look it should look nice in most any home and system. The important question of course is whether it sounds any good, and with any luck I’ll be able to answer that for you. But first, I’d like to make a couple of points clear. I recently perused several of the more popular online audio forums and as usual I came across something that makes me sick to the gut. In this instance and on more than one forum, that something was related to the subject of hi-fi reviews and reviewers. One of these was a thinly veiled and nasty dig at yours truly. Thus, I will make this clear: I do not get paid for writing my reviews. I do not get kickbacks. I do not get incentives. I am not in cahoots with any dealer or importer. I do not give bad reviews for the very simple reason that so far, I haven’t been given anything bad to review. I take great care and spend a good deal of my free time in writing my reviews in as much detail and even-handedness as is possible. I do not lab-test any component because I do not have the facility or money to do so, but also because I believe that mostly, the proof is in the listening. If I could perform lab-tests I would do so just to see how my listening results correlate with measurement results. I love hi-fi and I love music and that is why I do this. Rant. Over. On with some tunes. I set the Arcam up with my Reference 3A speakers, Stockholm DAC and Lenco/Analog Instruments/EMT/Fi/Auditorium23 vinyl player, though the Fi stayed mostly unused, apart from serving as an occasional reference. The amp’s built-in moving magnet phono preamp is very quiet and sounds quite excellent – not amazing by audiophile standards but certainly up there with two of my favourite budget phonostages from Cambridge Audio, the 551p and 651p with their speedy and engaging character. I was pleased to discover that it worked rather well with my A23 SUT and moving coil EMT cartridge. I also used Arcam’s rBlink Bluetooth receiver/DAC, which I must write up a review on because it really is an excellent little gadget. Right away, the A29 came across with an expansive, room-filling sound, though I did think it lacked some of the depth and layering which made the A39 so appealing. However, both amps share a rich, smooth and clean nature, which helps to allow instruments to sound alive and real, with colour and texture. The bottom end doesn’t drop as deep but does have a nice coherent and tuneful quality, giving basslines good rhythm and resolution. For the most part, I found bass parts could sound note for note like actual instruments in the way one can perceive different strings or keys and their distinct tones and harmonics. The A29 isn’t deeply insightful when listening for intricate details, but you will hear plenty and probably be very happy. Other amplifiers will take you deeper into recordings but sometimes – not always – at the expensive of musicality or sheer enjoyment. I’d rather hear natural rhythms, harmonies and lifelike instruments than focus on every clinical detail. Of course, if a happy balance can be struck then that’s even better. It does have that lovely fluid and organic quality audiophiles love, along with a simple fun factor which I normally associate with budget amps from the likes of Marantz and Denon. It’s zippy, rhythmic and exciting, the type of amp you can rely on to sound good no matter your mood or current musical craving. Every genre I played sounded good, and whether it was Public Enemy or Sun Ra, Agnes Obel or Sleep, I enjoyed the music immensely. And when I was of a mind to crank the volume up to try and emulate concert sound-levels – and as my family might attest, that is most of the time – the A29 held it all together nicely. Conversely, at low volumes the amp retained its enjoyment levels. There are plenty of amps out there that just sound lifeless until you turn the volume right up, but this isn’t one of them. I was treated to a clear and open treble when listening to Rickie Lee Jones sing on Traffic From Paradise (CD to FLAC rip). The amp coped with the full range of her vocals, not breaking up even at high volume. Her voice was breathy and natural, though not quite as nasally as it was through the A39. The sound from the recording wasn’t overly layered, and I do like a bit more air around the instruments to give that sense of separation, but overall there was plenty going on with decent timbres, tonal balance and genuinely engaging rhythm. I had a sudden urge to move on to Alex Chilton’s astonishing and brilliant – and scandalously little-known – 1986 album High Priest (16/44.1 FLAC – if anyone has a vinyl copy to sell, I’ve been after one for years), because I especially love the drum sound, the rhythm and the grubby funk/soul/blues- infused rock ’n’ roll. Yes, it’s quite different to the jangly power pop of Big Star from the previous decade. ‘Make A Little Love’ sounds almost like Lou Reed backed by the Blues Brothers, with full exuberant horn section, while the cheeky ‘Dalai Lama’ is one of my all-time favourite songs with its playful lyrics (“Up in Tibet high in the Himalayas/There lives a cat called the Dalai Lama/In a palace called the Potala/ A thousand rooms in a thousand colours/She had a far-out decorator”, et cetera) and an irresistibly rollicking beat. With the A29, the rhythm section certainly had a good swing and bounce, the drum skins properly sounded like they were being smacked and kicked and Chilton’s voice had a nice level of reverb. I’ve often thought the album sounds like it was recorded live in the studio, and the Arcam helped keep that illusion going in my mind. Sometimes you can sense a certain electricity when a band is all together in the studio – The Doors’ LA Woman is a good example – and it can sound so much better. Regardless of the recording environment, or the format, I’ll be damned if the album wasn’t reproduced by the Arcam sweetly and packed full of boogie. As usual, I was utterly captivated by Aldous Harding while I listened to her most recent record Party. Give me a pair of $10 earphones and a cheap MP3 player and I would no doubt be just as enthralled, but a good stereo really does justice to her recordings. The A29 projected her voice out of the shadows effortlessly, with nice scale and presence, highlighting her nuances and affectations (I mean that in the best possible way) to keep her sounding alive and intriguing. This extended to the other instruments on the album, which accentuated the mood of each song with poise and consistency as required. There was good balance across the tones and a satisfying musicality that made me want to keep listening. When I listened to Wilco’s ‘At Least That’s What You Said’ from A Ghost Is Born (180g vinyl) – as I’m apt to do when reviewing equipment – I found the A29 kept everything together cohesively, and though it felt a bit closed-in, timing and rhythm were excellent. The A39 deciphered the barrage with a little more elegance and insight, but its little sibling gave it a good whack and the bass, while not as tuneful, seemed to have more impact in the way it thudded and chugged along. We’re talking both bass guitar and bass drum here, and I love seeing peoples’ reaction when they kick in following the piano and vocal intro. It’s quite entertaining to see them jump, especially if I’ve managed to gradually and surreptitiously raise the volume leading up to the dramatic change in tempo and dynamics. I urge you to try it on unsuspecting guests. And the air in my room certainly moved when I inevitably went loose with the Arcam’s volume control. I was simultaneously filled with exhilaration, along with a slight feeling of guilt that perhaps my neighbours might not be as appreciative of the performance as I was. The guitar was vibrant and electrifying and although the piano occasionally lost its way under the cacophony – it was there, I just had to listen for it – it managed to preserve its tonal integrity. Despite its somewhat unassuming looks, the A29 has plenty of power and punch and proved to be a most enjoyable companion to my motley crew of hi-fi components. It’s a very easy amplifier to get along with. Painting a convincing audio picture, it has a good tonal balance and great dynamic ability, which means music is not only honest and exciting, but above all, well worth listening to. I reckon the A29 makes up for any shortcomings, with its bold and energetic nature coupled with a tendency to just get out of the way and let the music do its thing. At this price – and it’s a good price – there is a lot of competition from the likes of Rega, Rotel, Marantz and many others, including those using valves rather than transistors, but I highly recommend giving Arcam a serious audition, because it might be just what you’re looking for.